Protect your new guitar! This rugged heavy-duty bag features a plush lined interior and a heavy-gauge two-pull zipper, allowing the bag can be unzipped length-wise from the center. Use either the two carrying handles for a well-balanced load or the removable, adjustable shoulder strap to carry your guitar with ease. 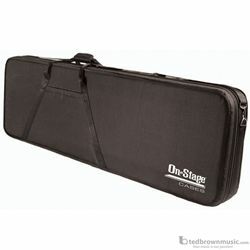 A front accessories compartment is perfect for pics, replacement strings or other accessories.